No, this is not an early Halloween post. 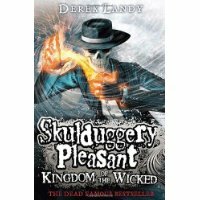 I just learned that the most recent Skulduggery Pleasant book, Last Stand of Dead Men by Derek Landy, went on sale a little over a week ago. By "went on sale," of course, I mean "went on sale in the UK," since it's not available in this country. However, I am your source for Skulduggeryness in the U.S. of A., at least in terms of talking about this series. Because the new book just went on sale, this seems like a good time for me to write about the last book, book 7, Kingdom of the Wicked, which I finished a few weeks ago. This is probably my favorite of the last few books in terms of coherent storyline. There may be a reason for this. According to the Kingdom of the Wicked page at the Skulduggery Pleasant website, this series is broken into trilogies. Book 7 started a new trilogy. I'm definitely liking the political goings on with this one. These books are violent, anyway, and the characters often find themselves in desperate straits. I can recall reading others in the series and wondering how they could possibly survive what was going on. Kingdom of the Wicked has a very extended culminating battle scene. Seriously, it took me three sittings to get through it, and not because I found it disturbing. I started while on a stationary bike, read some more before bed, and finished the next morning. It was long. I must also say that this book has one of the best surprise cliffhangers I can recall in any serial book. Question: What happened to the journalist from book 6 who was going to blow the whistle on the world of magic? The author thought better of it? Also, I so hope Landy isn't working on a romance between protagonist Stephanie/Valkyrie and Skulduggery. Please, please, please don't let it happen. Teenage girl pairing up with paranormal skeleton--such a cliche. I think it's been a few years since I've done a father book post. The Skulduggery and Valkyrie pairing could be a workable father/child relationship. After all, he lost his own child centuries ago. She is his chance to live that relationship. By the way, the Skulduggery Pleasant website says that Last Stand of Dead Men is the number one selling children's book in the UK right now. I haven't been able to verify that, but the series is supposed to be popular there, so I'll take their word for it.